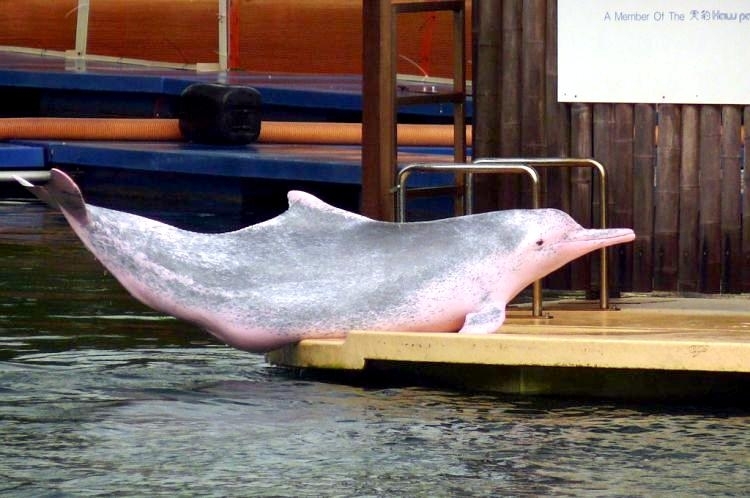 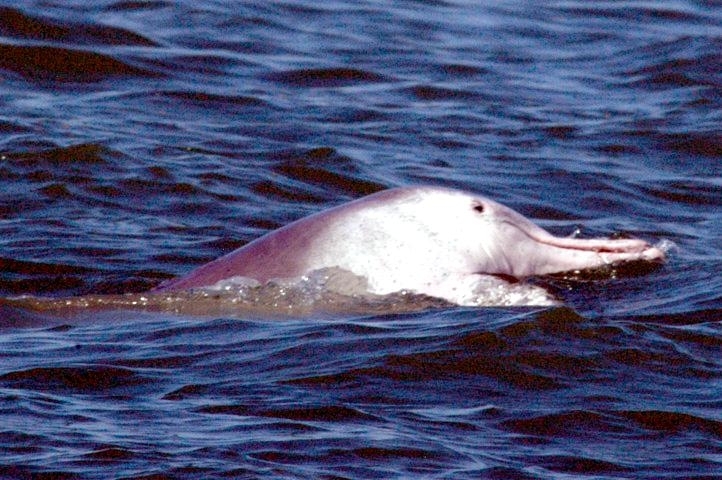 Indo-Pacific Humpback Dolphins are characterized by a stocky body and long, well-defined beaks. 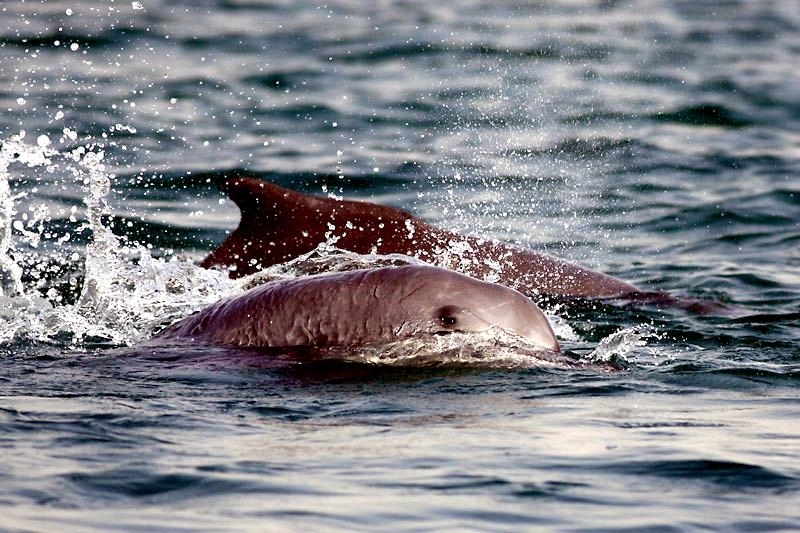 They are named for their dorsal fin that in most populations, sits on a hump that is more pronounced in males. 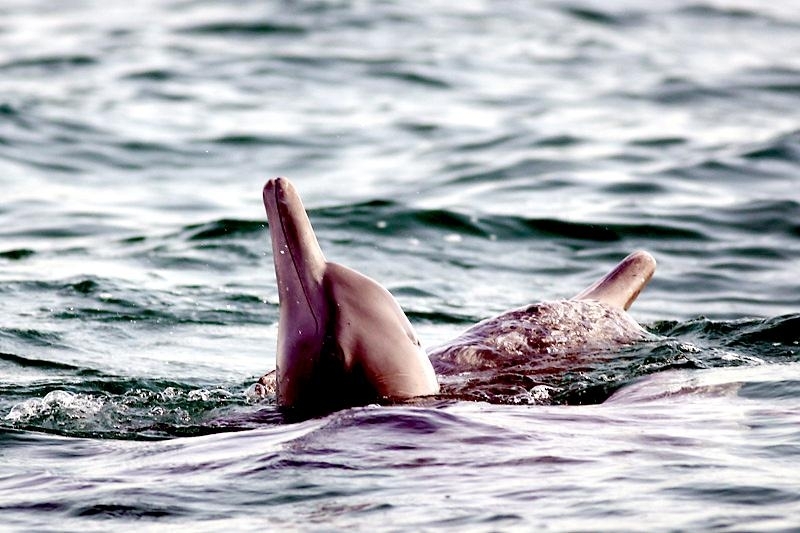 Some of these dolphins also have distinctive ridges along their tail stocks, the area just in front of their flukes. 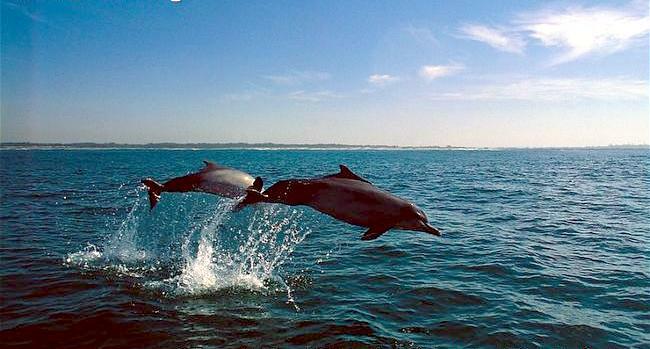 Males reach a maximum of 3.2 meters in length, females 2.5 meters and adults weigh up to 285 kilograms. 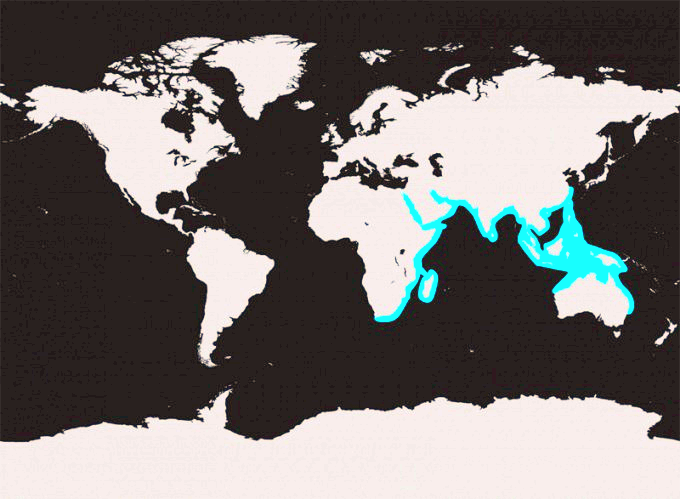 This species varies in color by age & region. 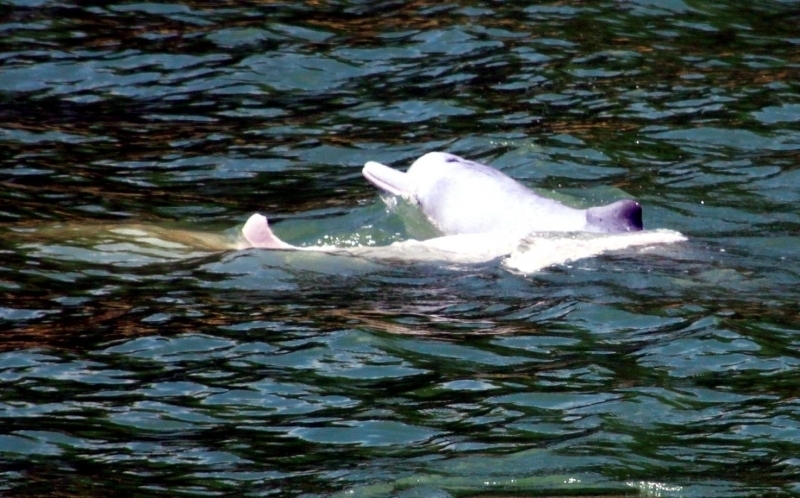 Some are light in color when they are born, darkening to a dark gray on their dorsal (upper) sides, light gray on their ventral (under) sides. 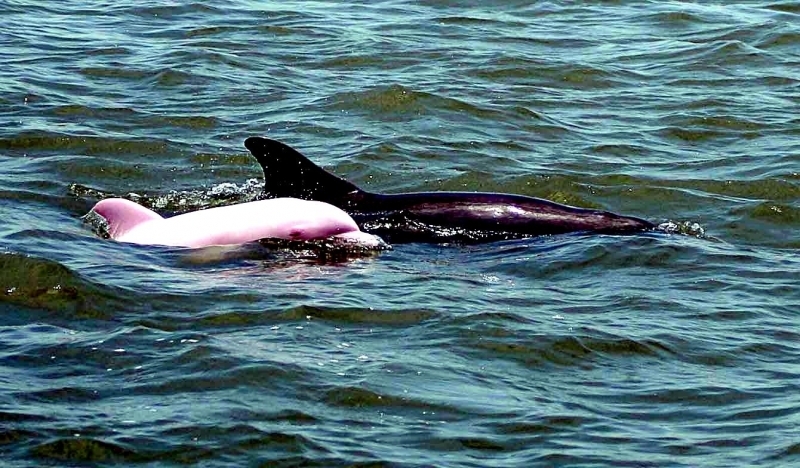 In the western Indian Ocean and off the coast of China, calves are born with dark coloring that lightens with age to a pink-tinted white color with spotted patterns. 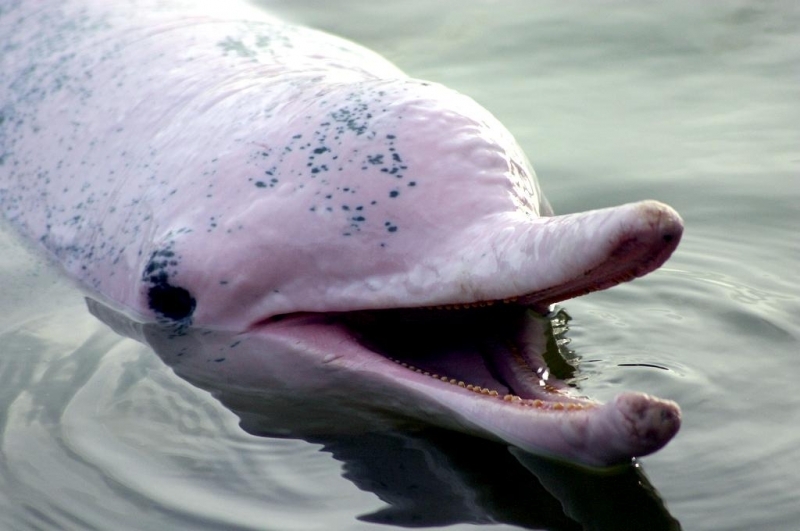 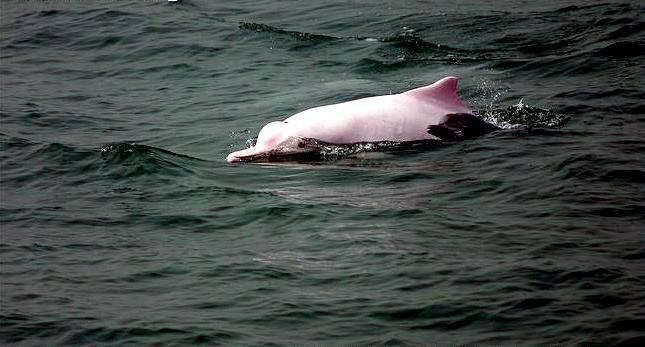 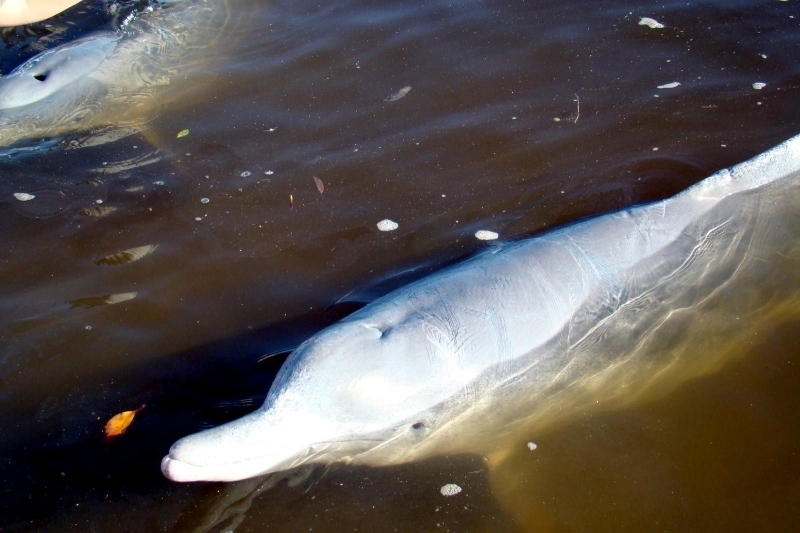 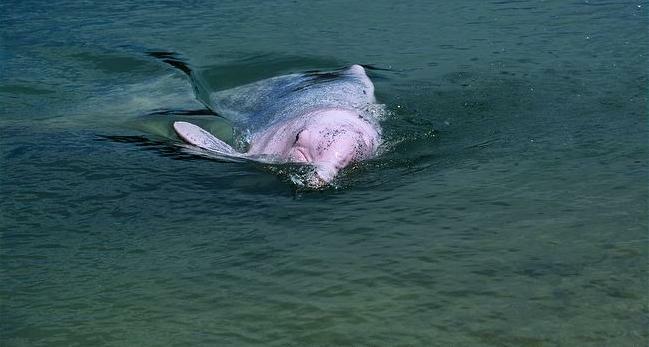 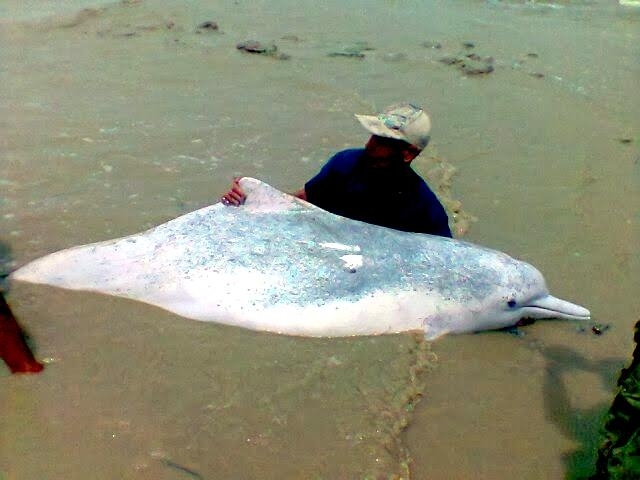 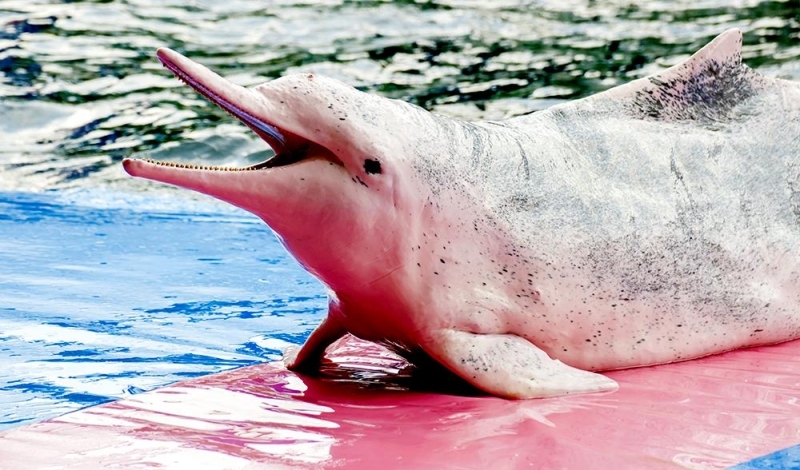 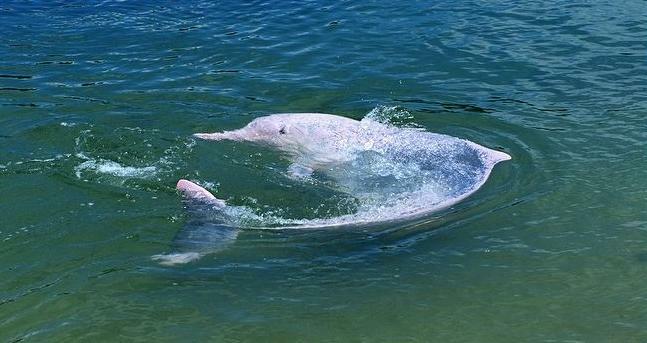 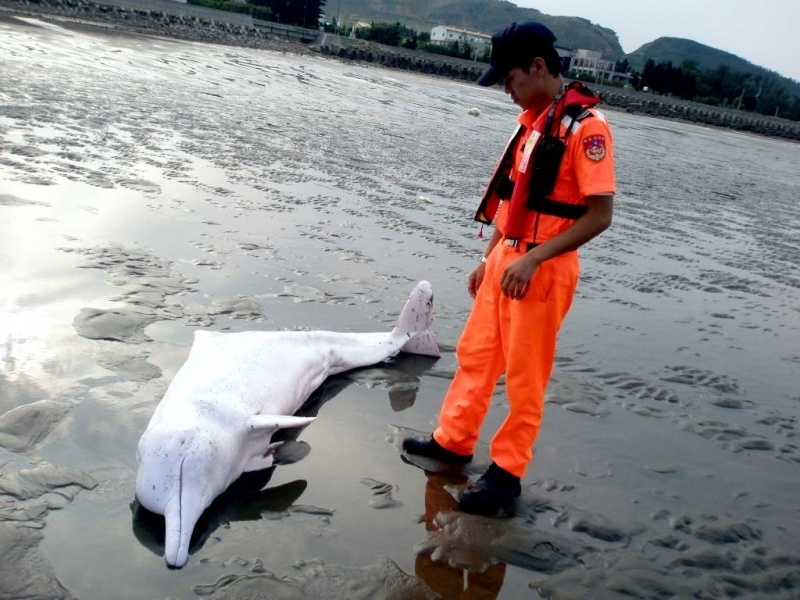 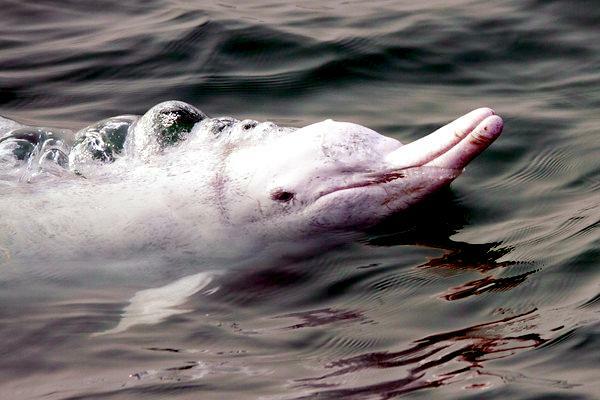 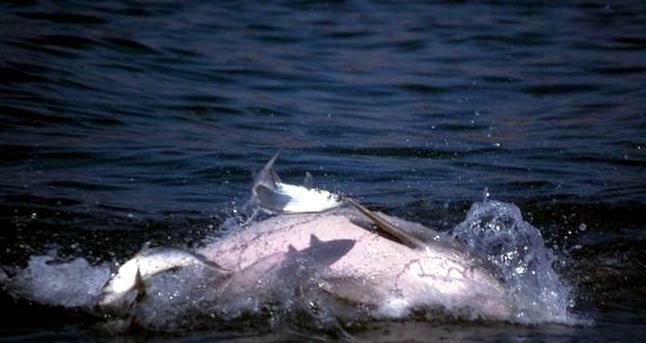 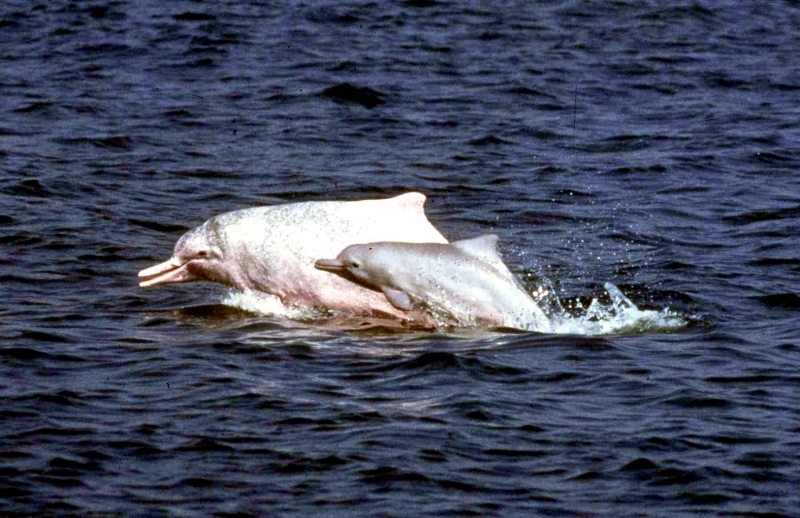 Indo-Pacific Humpback Dolphins near Malaysia and northern Australia however, are nearly white. 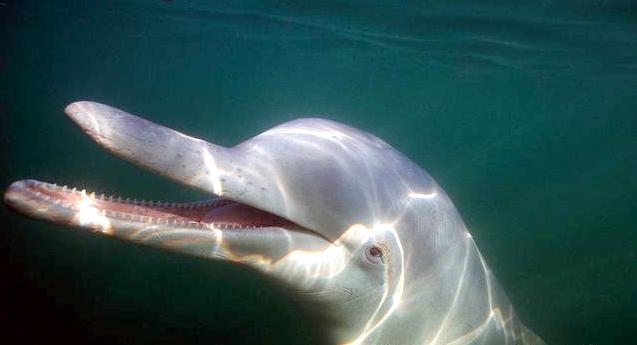 This species has 29-38 peg-like teeth in their upper and lower jaws. 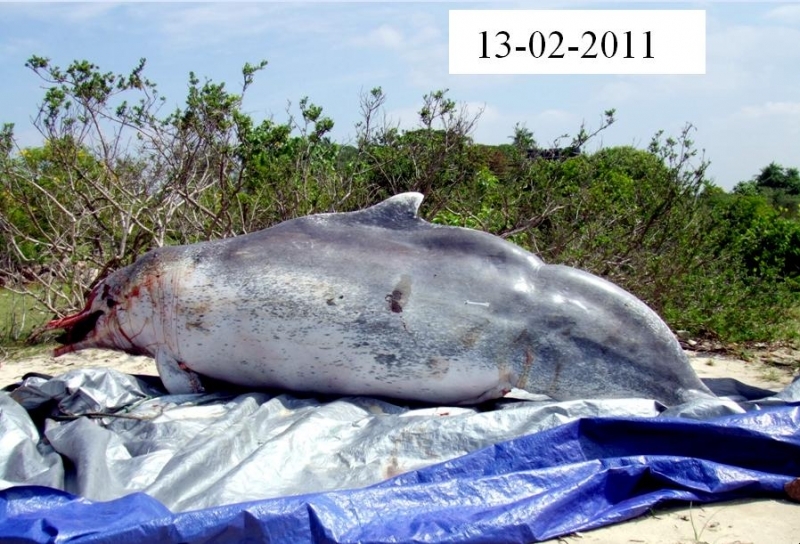 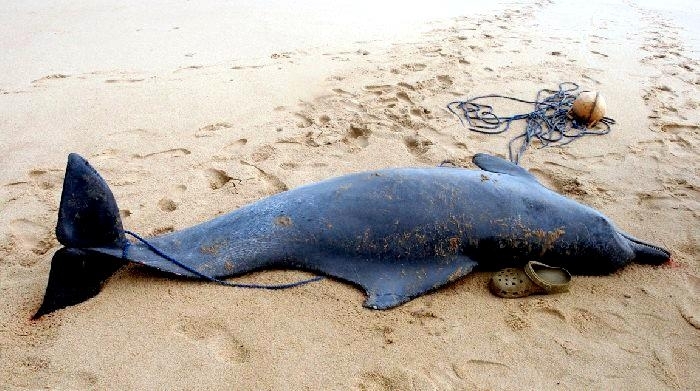 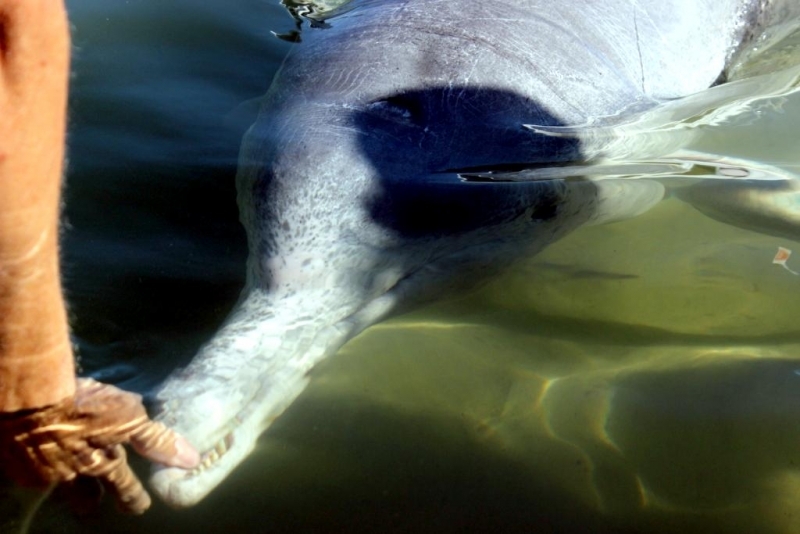 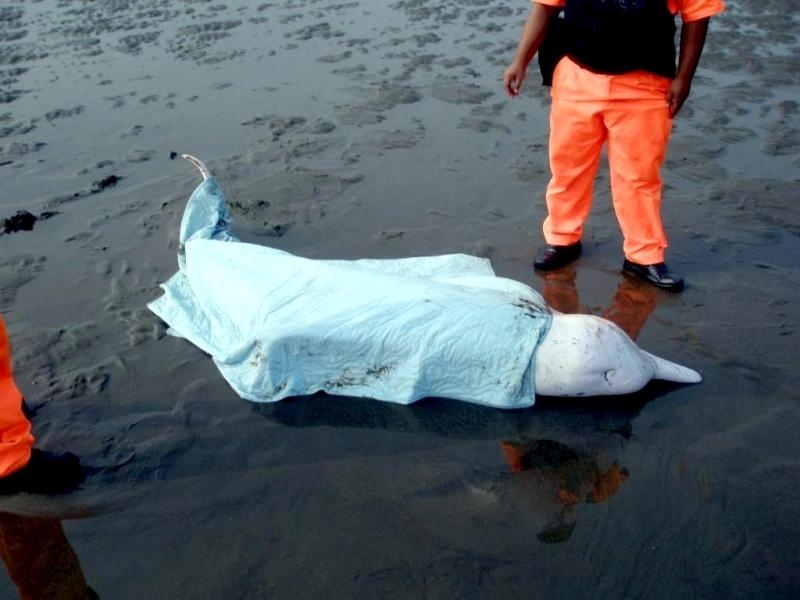 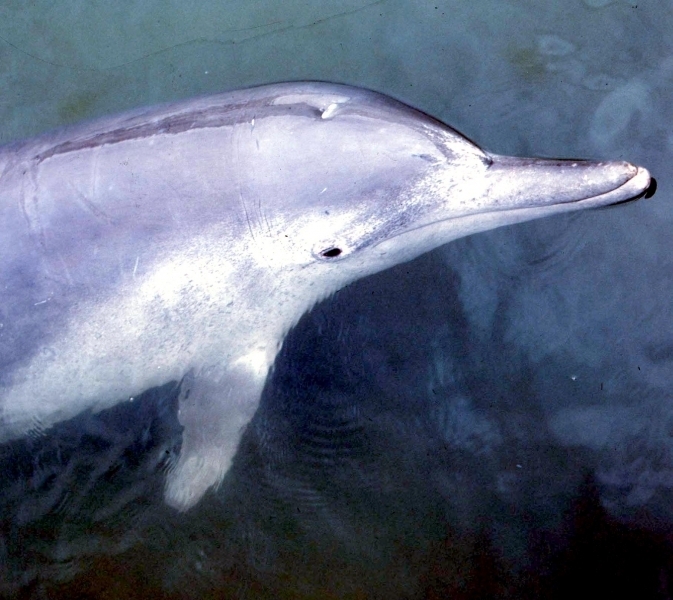 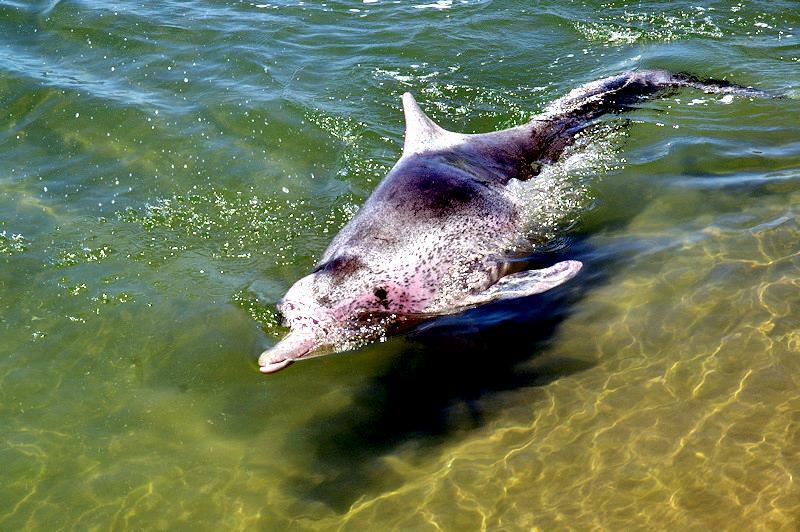 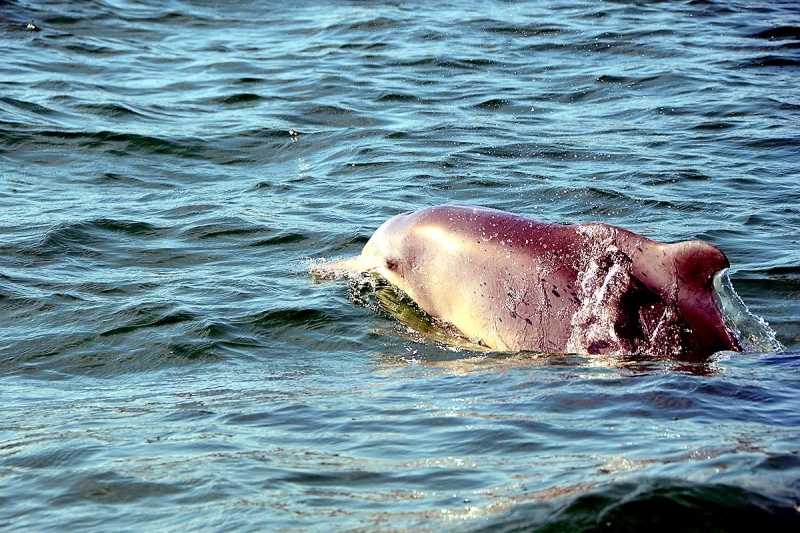 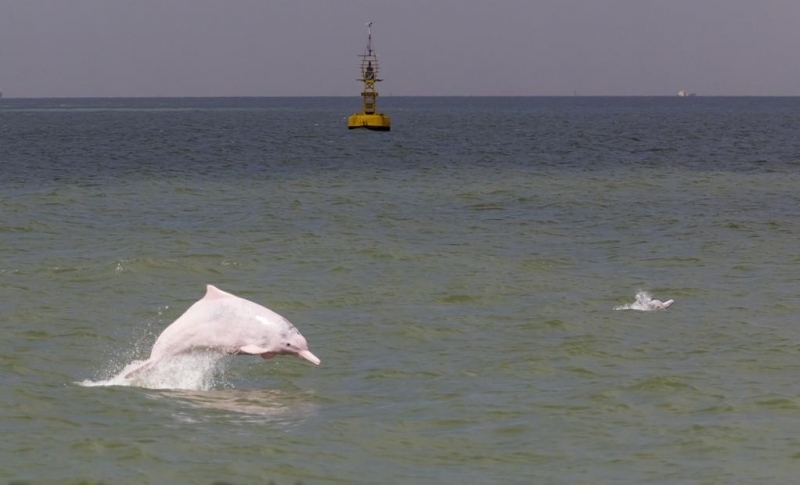 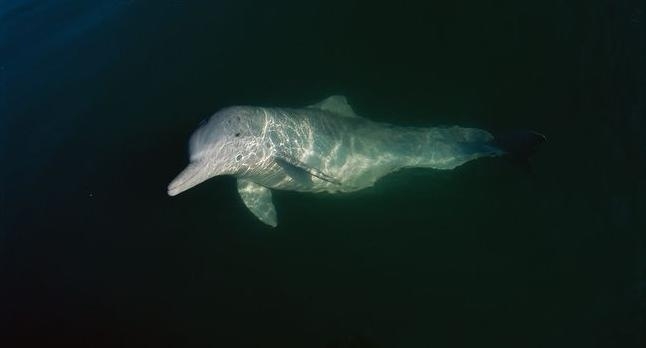 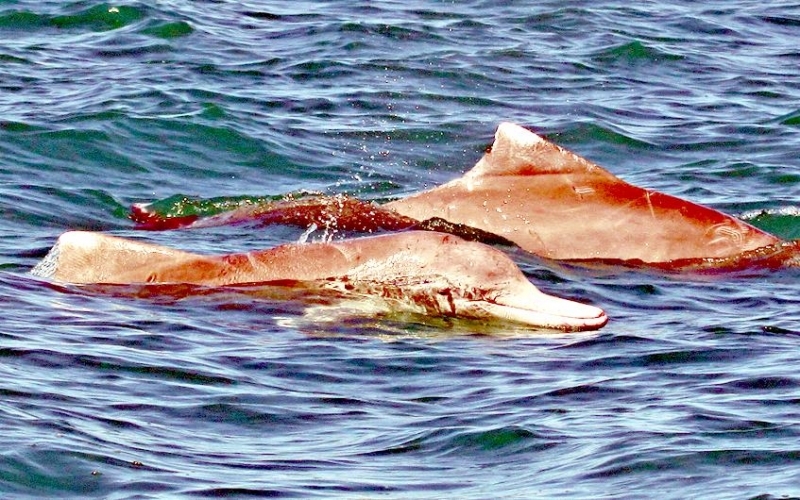 Pods of Indo-Pacific Humpback Dolphins observed off the coast of South Africa appeared stable. 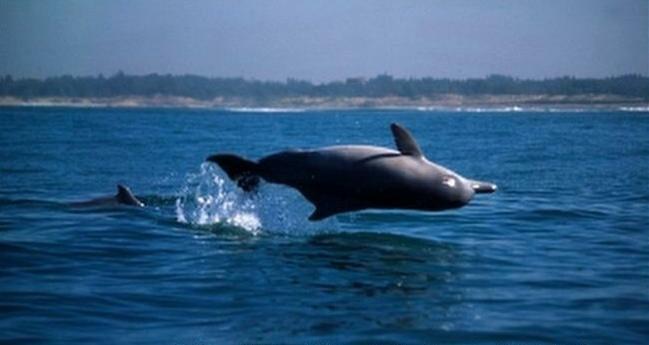 Also off South Africa, pods appear to prefer sandy bays for resting & socializing and open rocky coastline for foraging. 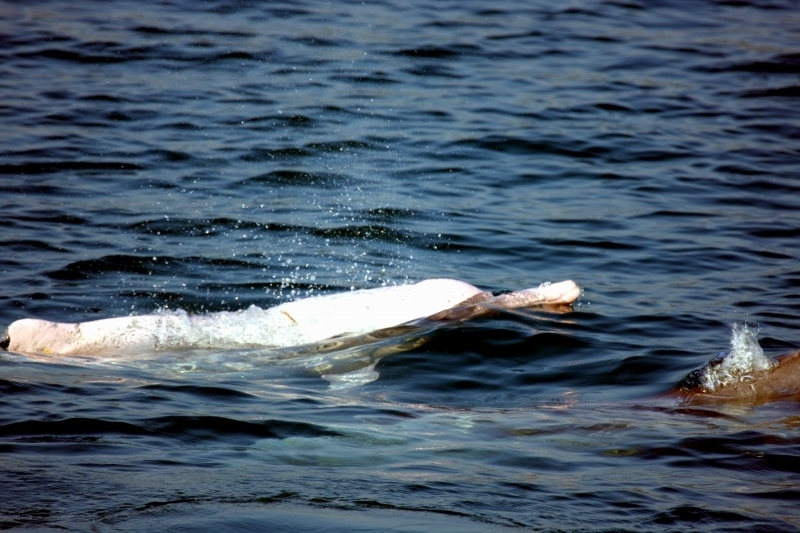 These dolphins are moderately acrobatic slow swimmers (average 4.8 kph) and are rarely seen bow riding. 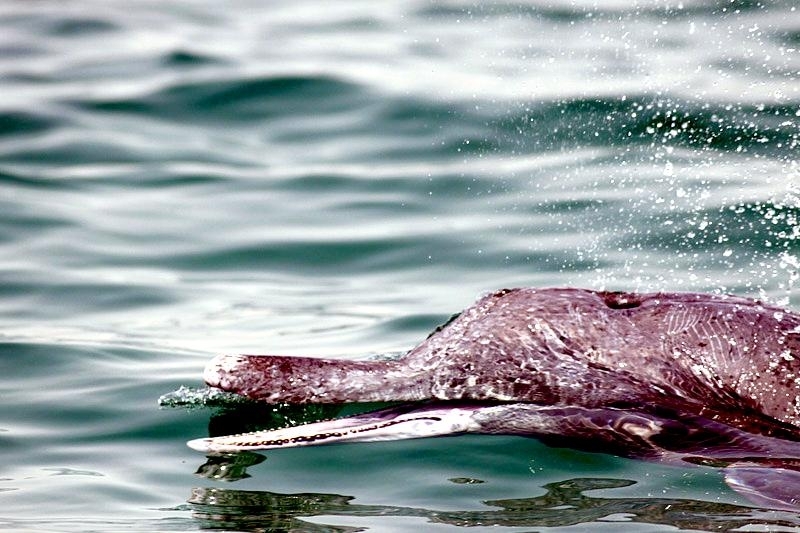 In spite of their slow swim speed, they have been known to chase off or even kill sharks. 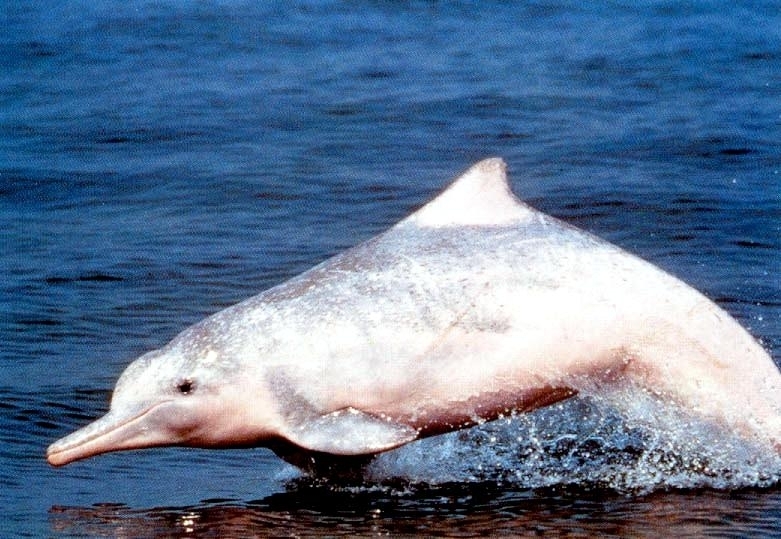 Indo-Pacific Humpback Dolphins are found in tropical and temperate coastal waters of the Indian & Pacific Oceans from northern Australia and southern China in the east, through Indonesia and around the coastal rim of the Indian Ocean to southern Africa. 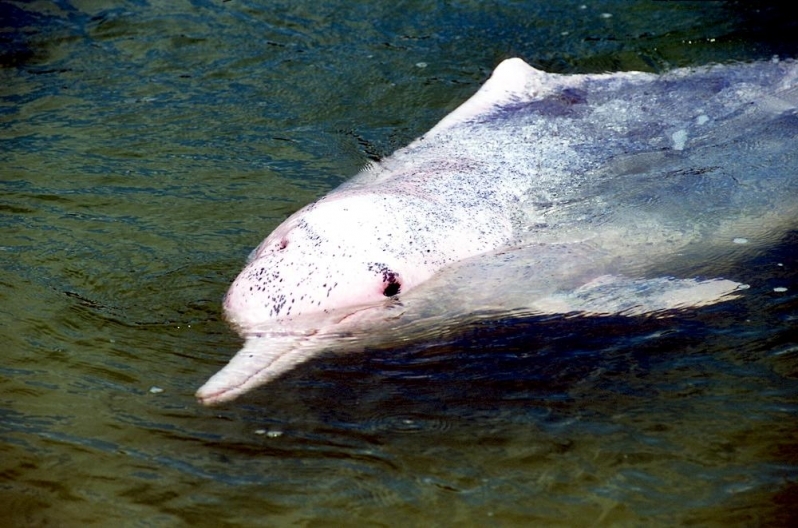 They are known to enter rivers, estuaries and mangroves. 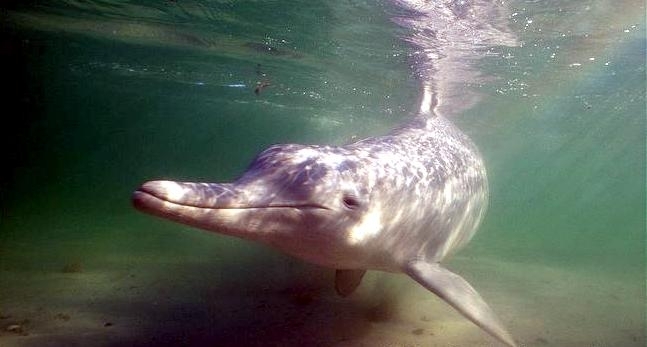 They prefer shallow waters 20 meters in-depth with warm temperatures between 15-36 °C. 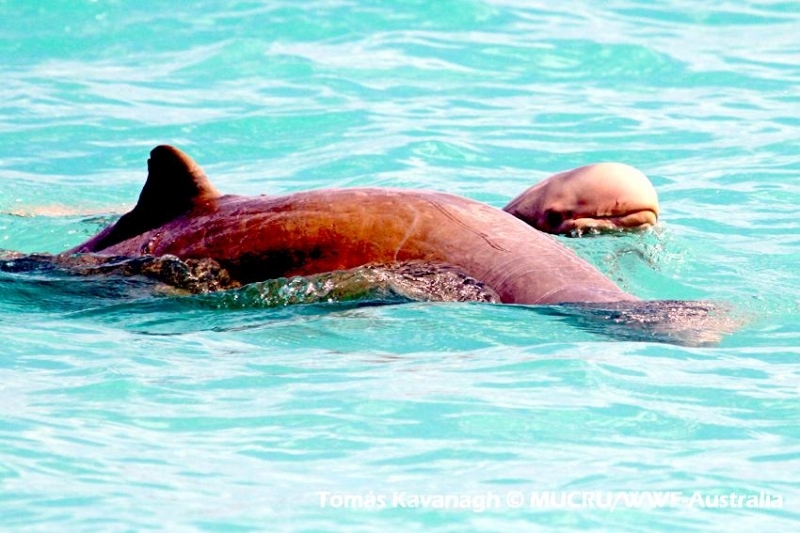 Indo-Pacific Humpback Dolphins feed near the shore on reef fish, mollusks and crustaceans. 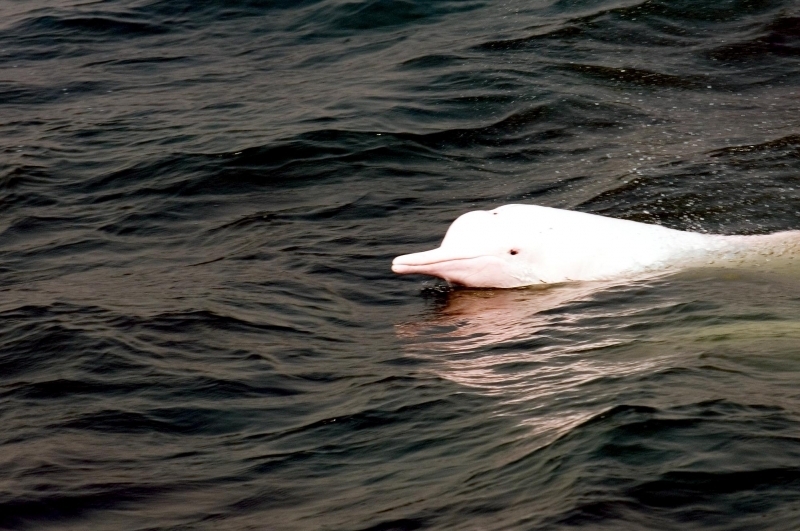 They tend to hunt in small pods using echolocation to find prey, although they have been observed also hunting individually. 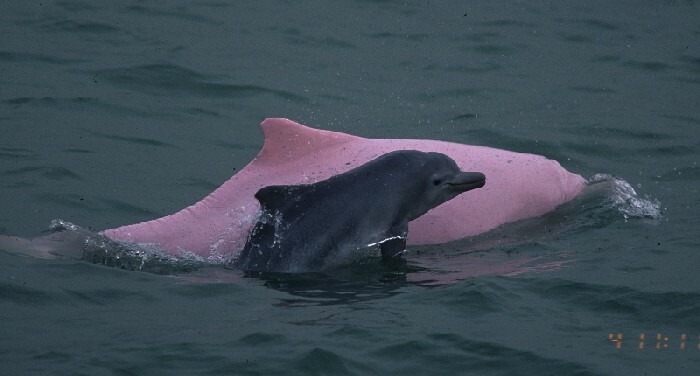 Indo-Pacific Humpback Dolphins are considered to be a gregarious species, but they are also known to be aggressive particularly when feeding. 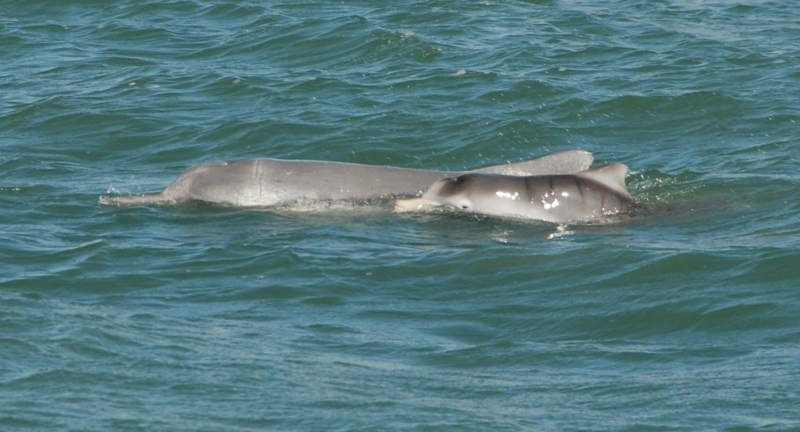 They appear to breed year-round and calves are generally born during summer months between December-February. 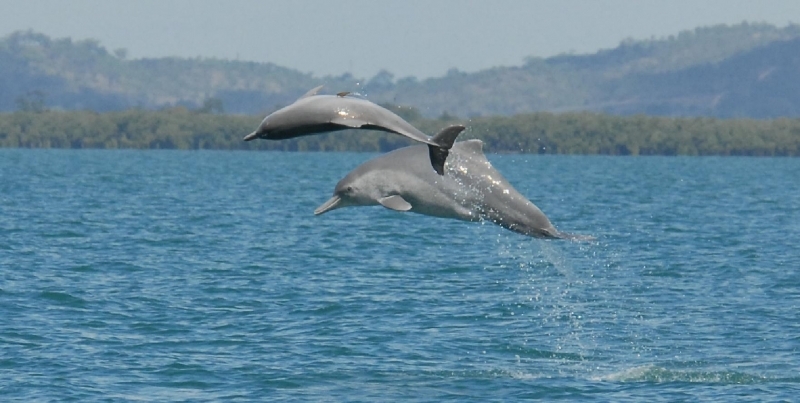 Mating behaviors are thought to include chasing each other in circles at higher speeds, swimming on one side while waving a flipper in the air and somersaulting.